This is a mixed media collage painting on canvas. The size is 16" x 20" and it includes a raised gold leaf pattern for the border that took many layers to create. I then wash several layers of paint over the gold leafed area to create an "old world" feel. The interior of the "travel journal" has lots of interesting elements and includes a beautiful Magyar postage stamp. The edges of the canvas are painted black. this is so elegant and special !!! i love when you work with this kind of media too . 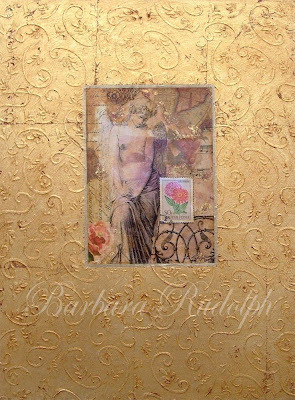 This work of yours is so nice, I like how the light is captured and dances within the raised gold leaf pattern. I love painting and creating with my hands, come have a visit to my blog.